This article is about the neighborhood in Atlanta, Georgia. For other uses, see Atlantic station (disambiguation). Atlantic Station was designed with energy efficiency in mind and many of the buildings are LEED certified. Additionally, the project was developed to help mitigate urban sprawl and reduce air pollution by allowing many more people to live and work within walking distance of most everyday things they need, with many alternative transportation options nearby. The proposed BeltLine transit/greenway project is expected to pass within a few miles of the development. In a joint venture, North American Properties Atlanta, founded by Mark Toro, and CB Richard Ellis Investors closed on the purchase of Atlantic Station's retail component on December 31, 2010. Toro and the NAP management launched a social media blitz, attended community meetings and real estate symposiums to openly discuss challenges, such as crime, and invite feedback. Toro's vision to transform Atlantic Station included new retail, new restaurants, better parking and a renewed effort to make Atlantic Station a destination for in-town residents. On October 1, 2015, Atlantic Station's retail core was officially sold to Hines Interest Limited Partnership with an unnamed joint financial partner. 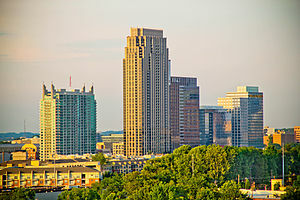 Atlantic Station comprises three distinct areas that are lined along 17th Street between the Downtown Connector and Northside Drive, the District, the Commons, and the Village. The District's office space is located along the six-lane 17th Street Corridor, and is home to the 22-story tall 171 17th Street, known as the Wells Fargo Building and completed in 2004, and the 17-story 201 17th Street, completed in 2007. Developed by AIG Global Real Estate, 171 17th Street was awarded the silver certificate in the U.S. Green Building Council's Leadership in Energy and Environmental Design (LEED) Core and Shell Development program. 171 17th Street became the first-ever LEED Silver-Core and Shell certified high-rise office building, and the first high-rise office building in Georgia to receive any LEED certification. The 25-story BB&T Tower at 271 17th Street was completed in 2009, becoming Atlantic Station's tallest office tower. 271 was designed by tvsdesign and built by Brasfield & Gorrie. Current tenants include Athleta, The Athlete's Foot, Atlanta Falcons Official Team Store, Atlanta United Official Team Store, AT&T, Banana Republic, Bath & Body Works, Cellairis, Dermalogica, Dillard's, DSW, Earth and Sky Creations, Express, The Eye Gallery, Fab'rik, Francesca's, Gap, H&M, Icing, Ikea, It'Sugar, Jos A. Bank, Journey's, Kate's, Kinnucan's, LA Fitness, Loft, Lush Nail Bar, Old Navy, Publix, Regal Cinemas, Target, Tervis, Victoria's Secret, West Elm, and Z Gallerie. Current restaurant tenants include Atlantic Grill, BGR The Burger Joint, Boneheads, California Pizza Kitchen, Chick-A-Biddy, Great American Cookies, Kilwins Chocolates & Ice Cream, Land of A Thousand Hills, Meehan's Public House, The Pig & the Pearl, Rosa Mexicano, Subway, Tin Drum, Which Wich, Yard House, Atlanta's first Salata, and Yogli Mogli. The Premier Exhibition Center at Atlantic Station is currently home to the exhibit Bodies: The Exhibition. 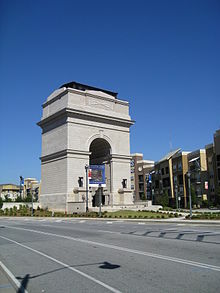 Adjacent to the Commons pond is the Millennium Gate, an $18 million arch intended to celebrate peaceful accomplishment, with special attention paid to Georgia's rich history and people. The Millennium Gate opened July 4, 2008. As of 2008, it is the largest classical monument to have been dedicated since completion of the Jefferson Memorial in Washington, D.C.. Hugh Petter of ADAM Architecture was commissioned by the National Monuments Foundation to work alongside National Monuments director, Rodney Cook Jr., to develop the initial concepts into the final architectural design. The design is embellished with a sculptural allegory by Alexander Stoddart, telling the story of peaceful accomplishment over the last 2000 years. It houses 12,000 sq ft (1,100 m2) of gallery space, featuring traditional and modern exhibits. Collections of artifacts and family histories contribute to exhibits showcasing the pioneering and philanthropic spirit behind the development of Atlanta. Other exhibits include a recreation of the 1928 Rhodes-Robinson House[permanent dead link] foyer located on West Paces Ferry Road and a recreation of Thomas K. Glenn's office. Mr. Glenn, the late chairman of Trust Company bank, in the 1930s ran Atlantic Steel, previous owner of the land that is now Atlantic Station. Glenn's family is among the project's supporters. The Millennium Gate has been greeted with puzzlement regarding its purpose, and it has been criticized by Modernists for its historic references. To this, New York sculptor George Kelly responds that "People are more drawn to tradition. It's the scale of it, it's the warmth of it. The word is beauty." Because of its proximity to the IKEA furniture store, some observers have given it the nickname "Arc d’Ikea." The primary roadway access to and through Atlantic Station is an extension of 17th Street constructed by the developers. As part of the project, the Georgia Department of Transportation erected the yellow 17th Street bridge over the I-75/85 Downtown Connector expressway that separated Atlantic Station and the Home Park residential neighborhood from the rest of Midtown. Controversy developed at the time of construction not only because of the bridge's unusual yellow color, but also for GDOT's insistence that the bridge and street meet suburban highway standards. Indeed, the bridge is eight lanes wide, and the enormous right-of-way afforded to 17th Street east of the bridge lacks street parking and utilizes an unusual arrangement of placing street trees and lamps at the edge of the adjacent buildings' property lines instead of against the street. Motorcycles are not allowed. The section of the Street west of the bridge consists of four through-lanes of traffic, in addition to a bus lane, bike lane, and turning lanes in each direction, also lacking street parking. Access to public transportation is provided via a free shuttle that runs every 5–15 minutes to the Arts Center MARTA rail station and MARTA bus route (110 Peachtree St./"The Peach" ), which also serves the Arts Center Station. A railroad line runs along the northern border, but passenger service on the Crescent (Amtrak) is available only at the Peachtree Station in Brookwood, one walking mile away. In April 2011, the city of Atlanta submitted a grant application seeking $22.5 million to relocate that station to the Atlantic Station community. Shuttle service is also provided by Lanier Parking Solutions, for Georgia Tech students in the student apartments, the Flats. Despite the pedestrian-friendly arrangement of much of the eastern section of the project, parking is inexpensive (first two hours of deck parking is free) and easily available in underground parking decks; indeed most visitors arrive by car. ^ "Health Consultation: Atlantic Station Redevelopment" (PDF). United States Department of Health and Human Services. August 9, 2004. Retrieved March 16, 2016. ^ "Atlantic Station shopping a retail rush for city". Atlanta Business Chronicle. March 3, 2006. Retrieved October 17, 2008. ^ "Cracking the zip code of Atlanta cool". Atlanta Journal Constitution. April 25, 2008. Retrieved September 25, 2008. ^ "Atlantic Station Fire Guts Lane's $55M Element Condos". Globe St. July 25, 2005. Archived from the original on September 28, 2007. Retrieved March 29, 2007. ^ a b c "Atlantic Station Blaze Deliberately Set". WSB-TV. July 27, 2005. Archived from the original on September 27, 2007. Retrieved March 29, 2007. ^ "Turnaround Artist". National Real Estate Investor. May 1, 2011. Retrieved October 23, 2014. ^ "Mark Toro, white male, seeks diverse Twitter followers". Atlanta Journal Constitution. September 13, 2011. ^ "Mark Toro talks about Atlantic Station evolution". Atlanta InTown. February 25, 2011. ^ Trubey, J. Scott (October 1, 2015). "Atlantic Station retail core sold". The Atlanta Journal-Constitution. Cox Media Group. Retrieved October 18, 2016. ^ "Atlantic Station: Atlantic Steel Brownfield Site Redevelopment (1997–2002)". ^ Rauch, Joe (July 19, 2007). "BB&T to consolidate at Atlantic Station tower". Atlanta Business Chronicle. Retrieved October 17, 2008. ^ Glier, Ray (May 6, 2005). "IKEA faces logistics of high-density shopping". Atlanta Business Chronicle. Retrieved September 25, 2008. ^ "Shopping in Atlanta". Atlantic Station. Retrieved April 16, 2018. ^ "Atlanta Restaurants - Dining at Atlantic Station". Atlanticstation.com. Retrieved April 16, 2018. ^ "Man helps create giant arch monument for Atlantic Station". Atlanta Journal Constitution. June 15, 2008. Retrieved September 25, 2008. ^ Shaila Dewan, An Elaborate Arch, an Opaque Significance, The New York Times, April 30, 2009, page A16 of the New York edition. ^ Caldwell, Carla (April 14, 2011). "Historic Atl. Amtrak station could close". Atlanta Business Chronicle. Retrieved April 14, 2011. 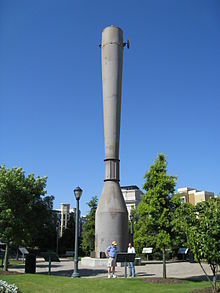 Wikimedia Commons has media related to Atlantic Station.